APNI is enormously grateful to Ceri Carney for organising and performing at the musical theatre concert entitled “You’ll Never Walk Alone” held on 12th March. The evening raised over £3500. Ceri and her talented friends performed in front of families and friends at The Beck Theatre in Middlesex. 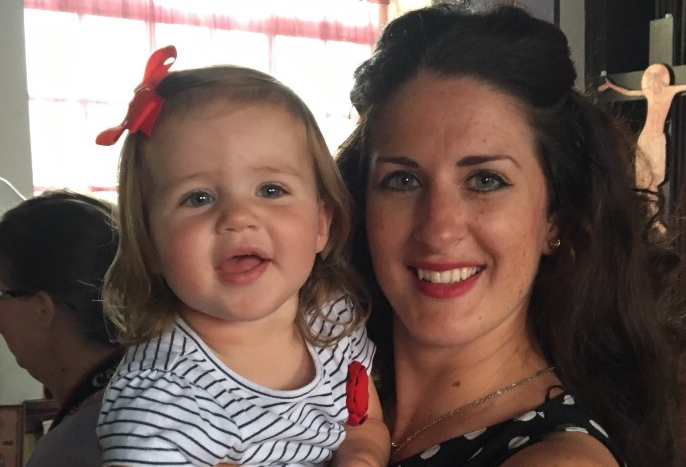 Ceri’s experience of postnatal anxiety and depression happened after the birth of her little Lucy. Ceri’s aim was to help raise the profile of APNI to continue its work in helping more mums who are suffering, to let them know they are not alone. The following is Ceri’s story told in her own words. As well as the amazing contribution she has raised APNI would also like to thank Ceri for her candid account and the motivation behind why she organised this event. After being diagnosed with severe Post Natal Depression after the birth of my daughter Lucy, a tough road lay ahead for me and everybody who cared about me. It had taken a lot of courage to go to the doctors but I knew I really wasn’t feeling right and I couldn’t go on hoping it would just sort itself out. It was hard to admit to myself that I needed help because to me I felt like I was inadequate and weak to do so. What I considered to be weakness, was in fact a real illness and it took a lot of time for me to see that and get over the guilt. No way would anybody choose to feel the terrible emotions I felt for over a year after Lucy’s birth. I knew motherhood was going to be hard but my experiences of early motherhood were in fact terrifying. That is the only way I can describe the confusion I felt. Everything to do with looking after Lucy overwhelmed me and I felt sheer panic from morning till night. I hardly slept (i got 2-3 hours for the first few weeks) and when I had a chance to sleep, I couldn’t. My mind wouldn’t slow down and the lack of sleep exacerbated my anxiety, panic and fear further. I experienced bad panic attacks for what seemed like no reason and I found looking after Lucy really surreal. She didn’t feel like mine and my anxiety made me feel like there was no bond between us at all. I found taking her out in public really hard because I felt like the biggest fraud inside and I was worried people could see it. I dreaded being asked if I was enjoying being a mum because the answer was no, I really wasn’t and it ate me up inside. As you can imagine, this made me feel extremely low and I thought that I had made a huge mistake and that I didn’t love Lucy. I should never have become a mum, I wasn’t fit for the job. I was so scared of looking after Lucy that I never wanted to be on my own with her. When I tried to look after her alone I ended up having huge panic attacks and I felt like I was spiralling out of control. No matter how positive I tried to be or how many pep talks my husband and I had, my feelings of panic and terror would always return. I remember Paul asking me where had his ‘strong wife’ gone and I honestly didn’t know and was convinced she would never return. The guilt that comes with feeling like i did, was massive and so another layer of misery was added to my woes. I thought I would never feel like me again and I couldn’t see any future. I started to realise why people would want to end it all. I knew I couldn’t go through with it though and so the living nightmare continued. Lucy would cry first thing in the morning and I would wake up wishing that I hadn’t. I can’t tell you how scared I was to feel this way and how lonely I felt. I could have been in a room of hundreds of people and never have felt so alone in all my life. My daughter would smile at me and all I felt was a huge, aching knot in my chest. I distinctly remember breast feeding her one day and throwing up whilst doing so. I also remember planning on running away & i went to the bus stop in my pyjamas and called my mum. Of course I knew I couldn’t do it. It was definitely a cry for help. I really frightened my mum & husband that day and that’s when my family knew that I needed to seek help. When I look at the very few early photos of Lucy and I now, I find them really hard to look at. I can see in these photos that I wasn’t really present, you can see it in my eyes. They were hiding sadness and conflict. I wish I could have those moments back and rewrite them because I do feel robbed of any happy memories of those early days. Unfortunately, I also suffered from a lesser known illness called Post Natal OCD. Only 2 % of new mothers are diagnosed with this. I experienced frightening, intrusive thoughts and concluded these meant I was a danger to my daughter. In fact, I couldn’t have been more wrong and that’s why these thoughts plagued me. The more I tried to push them out of my mind or reason with them, the more they persisted. If I hadn’t have sought professional help I would have continued thinking I was the monster I thought I was. Intrusive thoughts amongst new mothers are quite common but these thoughts can come and go without any weight attached to them. I was quite the opposite and the thoughts became a huge obsession that I would torture myself with and they continued for a long time before intervention helped me understand them. It took medication and therapy to get me on the long road to recovery. I am a very impatient person and I had to face the facts that it was going to take time, not weeks or months but almost a year before I felt like the Ceri before Lucy again. My daughter has given me strength that I didn’t know existed and I am so lucky to be her mummy. I learn from her everyday and thank my lucky stars that she is in my life. I would like to thank my husband, family and all my friends who were there for me when I couldn’t be there for myself. They never gave up on me and therefore I never gave up on me either.